Place the apple slices on the bottom of a well greased 9×13 baking pan. In a medium-sized bowl, mix together ½ cup of sugar, cinnamon and ½ cup of pecans. Sprinkle the pecan/sugar mixture over the top of the apples. In the same bowl, mix together the egg, flour, 1 cup sugar, milk, melted butter, salt, baking powder and vanilla until smooth. 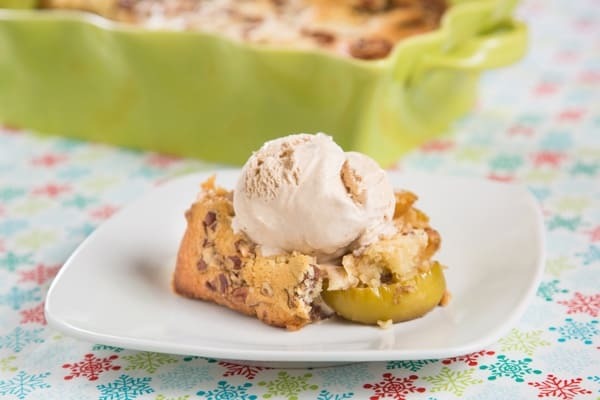 Pour the cake batter over the top of the apples and then sprinkle with the remaining pecans. Bake the cake for 50-55 minutes, or until it is cooked through. Remove from the oven and serve warm with a dollop of Gingerbread ice cream.